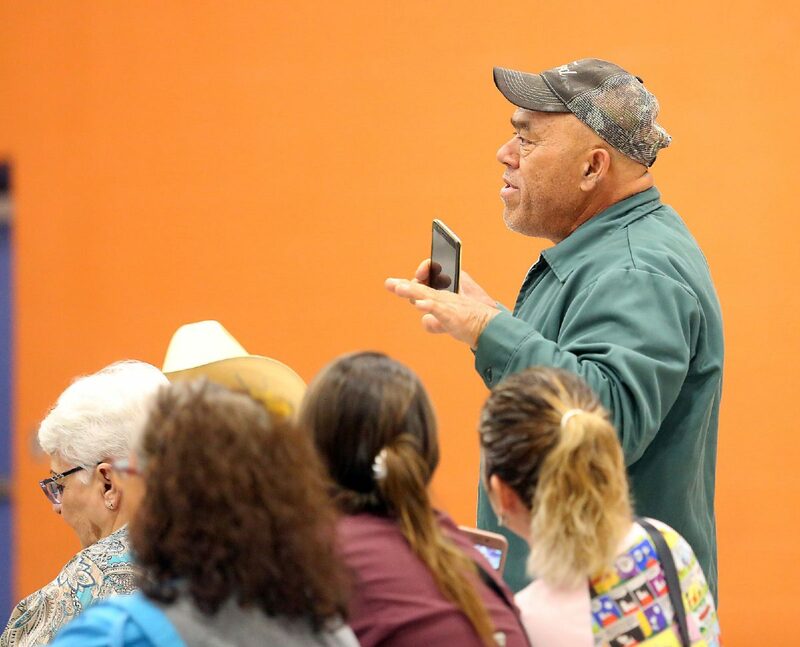 PALMVIEW — Residents did not hold back at a town hall meeting Thursday evening, airing their frustrations at the city council over unpaved streets. During the question and answer portion of the event, Blanca Silva confronted the council over the status of Perez Street, where she lives, saying that kids had to walk those streets with plastic bags around their shoes. The street is one of the many torn up around the city as part of the Palmview Wastewater Project, the initiative by the Agua Special Utility District to bring wastewater services to the city. The city and Agua SUD entered into an agreement allowing the city to pave the roads after Agua SUD has installed the sewer lines. Rojelio Garcia speaks during a city of Palmview town hall meeting the Palmview Recreation Center on Thursday, Oct. 25, 2018, in Palmview. 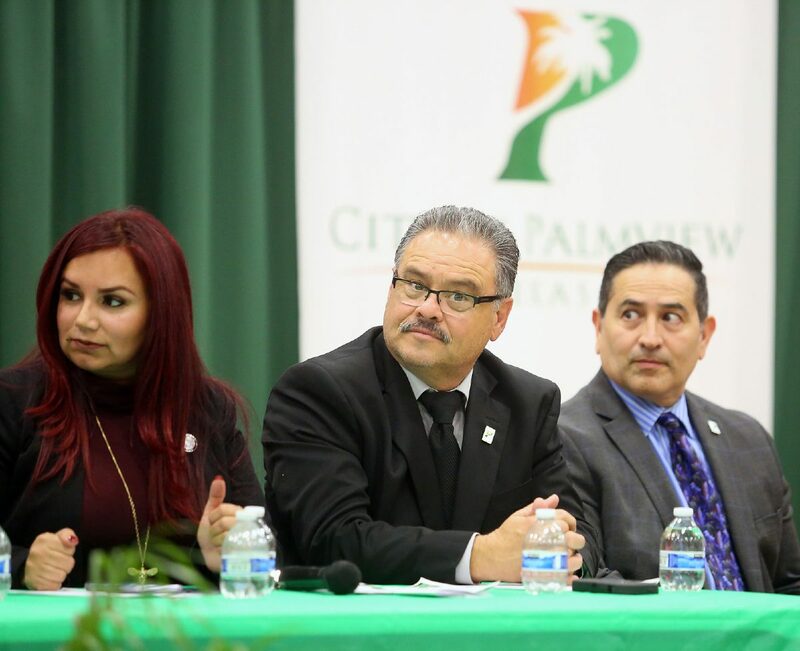 Palmview Mayor Pro-Tem Javier Ramirez, middle, listens during a city of Palmview town hall meeting the Palmview Recreation Center on Thursday, Oct. 25, 2018, in Palmview. A small segment of Perez Street has been released by Agua SUD but has not been paved. He noted that they only have 14 days to work on the streets so any streets that have been released, were just done so recently. Council member Javier Ramirez said he understood residents’ frustration given that his own street was in need of paving. Council member Linda Sarabia said complaints over the streets were anticipated and was hopeful that the town hall was educational. Department heads each had an opportunity to update the community on any new developments and upcoming projects. Fire Chief Jerry Alaniz touted the launch of EMS, or Emergency Medical Services, making the city one of the few throughout the Rio Grande Valley with city-owned and operated EMS. Interim City Manager Leo Olivares spoke not the completion of Showers Park for which the city held a grand opening on Oct. 15. The park includes recreational facilities including a track and a basketball court. One project in the works is the creation of a city library. Olivares said the initiative to bring one to the city began this year and with “seed money” of $20,000 to get the project going.